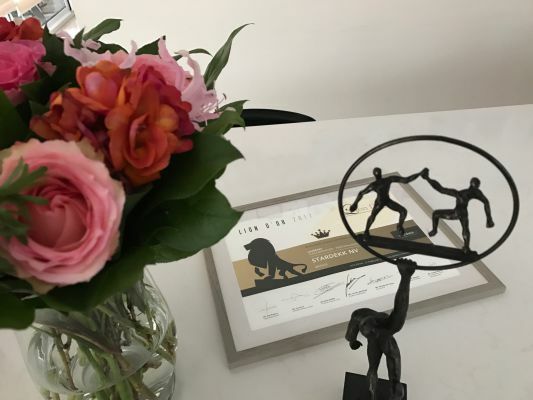 Yesterday evening the Lion d’Or was awarded on the Night of the Hospitality in Schelle. The Night of the Hospitality is linked to the Hospitality Awards, where hospitality businesses are awarded for their friendliness to customers. Stardekk, a company that makes websites & software for hotels & restaurants received the Lion d’Or in the category ‘Supplier’. To win the Lion d’or you must be nominated by the hotel & restaurant owners from the hospitality business. The most recommended businesses are then screened by a jury that looks at the big picture of the nominees. The jury praised Stardekk because of their close ties to the hotel and restaurant business and their strong products tailor made for the hospitality industry. Stardekk develops online software that makes things easier, creates more revenue, more direct bookings and less administration so that hospitality owners and employees can focus more on their core business. Stardekk’s manager Vincent Goemaere was very proud with the award. “It is a great honor to be nominated by our customers as their favorite supplier. To be honest, we see us more as a partner for the hospitality sector than as a supplier. That we were put on the first spot by a jury that is used to judge customer service is also nice. With our entire team, we try to help our customers the best way possible. That we have won this award is a sign for us to continue on the path we are on now”, concludes Vincent Goemaere.